Empire of Books: Zom-B Goddess cover revealed! FINALLY! We're nearly at the end and we will finally get all the answers to our zombie related questions... I hope! 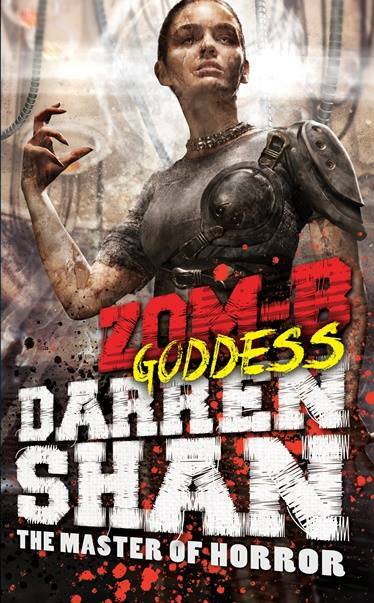 Zom-B Goddess is the twelfth and final book in Darren Shan's incredible Zom-B series. It's been 3 years since the first book was published, and now, in April 2016 the grand finale will be making an appearance and what an appearance it is... FEAST YOUR EYES!! WHAT!!! WHAT!!! What is life? That cover? Wow. It's the best of the series by far. It's epic, it's stunning to look at and after the quieter looking cover for Book 11, Zom-B Fugitive, it's exciting too. I love the colour of it, the armour B is wearing. Her expression - you better know she means business! I for one am incredibly excited to see how it is all going to unravel and cannot wait for the book to get here! Bravo Cliff Nielson for creating such a stunning looking series. All twelve books are great and really stand out.